Each March, thousands descend on Basel, Switzerland to see the latest in wristwatch luxurity and technical masterpieces with opulent complications. This year, Baselworld 2014 with its Brand Book focusing on the theme of “Brilliance” opened on March 27. It closes on April 3. 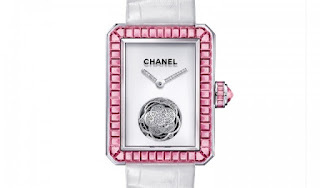 For me, one of the most dazzling and fashion-evocative women’s wristwatches is the House of Chanel’s 2014 Première Flying Tourbillon which I found covered by jewelry superstar media commentator Maria Doulton in her Jewellery Editor newsletter. There will be only 20 pieces in this limited edition which has 169 diamonds and 63 baguette-cut pink sapphires. These gems are beautifully set around a white gold case and crown. The Chanel flower tourbillion keeps its own botanical-inspired time performing one rotation each minute with the flying tourbillion’s petals indicating each passing second — horticulture and horology perfectly in time with each other. Just a word on Chanel and her affection for camellias. Lisa Chaney in her book, Coco Chanel: An Intimate Life, (Penguin Group, 2011) writes that Chanel probably first used the floral motif embroidered on a blouse in 1922, and by 1924 material renderings of it were added to her clothes. Since the camellia does not have a fragrance, wearing it does not compete with any perfume one also is wearing. The 2014 Première Flying Tourbillon is said to visually reference this unique floral feature with its crown in the shape of Chanel’s No. 5 perfume bottle stopper. I’d call that a semiotic show stopper which this time piece certainly is! Once again Maryhelen provides us with a posting that is original to most of us. There is nothing banal or deja vu in her exciting ideas. She has drawn our attention to the spinning movement of a flower and how it becomes a beautiful concept in a timepiece. Will 3D Printing Usurp the Human Hands of Time?